The Harman Pellet Pro 38 Plus is the least expensive of the Harman range of pellet stoves. 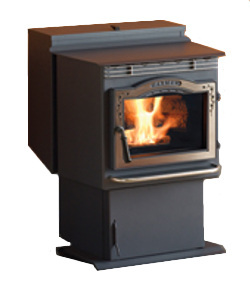 Originally introduced in 1991, but undergoing a few changes since then, this stove is simple in design and has worn well. It's a step top design with a flat viewing window. There is an option to add a hopper extension to increase capacity from 50 lbs. to 100 lbs. Giving a maximum burn time of 40 or 80 hours. In normal operation, this stove produces 38,000 btu. but it can be turned to turbo mode either manually or by the optional thermostat to give 43,000 btu. An exhaust temperature sensor prevents over-firing. Compared with many other pellet stoves, maintenance on the Harman Pellet Pro 38 Plus is ridiculously easy. See below for details. Max. Heat Output 43,000 btu. Min. Heat Output 7,000 btu. Window Size 12.5 in. by 10 in. Side heat shields, reducing distance to combustible materials from 16 in. to 10 in. This stove has no automatic ignition and with the optional thermostat will cycle between high and low but not restart itself. If you would like to leave a review of the Harman Pellet Pro 38 Plus pellet stove, please use the form on the contact page.